When Jacob was young, his grandfather told him many stories: stories of how he was chased by monsters out of Poland, how he took shelter on an island, at a home for children, in a place full of gardens and streams and sheep and safety. The children at the shelter had unusual skills: a levitating girl, an invisible boy, a young woman who could control fire. Abe even had a box of photographs from those days. Jacob had seen them so many times, that he felt as if he knew them personally. Eventually, he grew too old for his grandfather’s stories, and stopped believing. When his grandfather is killed one night, and dies raving about monsters and begging Jacob to carry a cryptic message for him, Jacob is shattered. Attempting to fulfill his grandfather’s final wishes leads him to a tiny island off the coast of England, where he finally finds Miss Peregrine’s Home for Peculiar Children. And something horrifying, called wights, and their further horrifying counterparts, hollowgasts. If you know anything about the myth of the wendigo , they will sound familiar to you. Either way, Jacob grandfather was fully justified in his terror of the creatures. The best part of this story is the creative format. Ransom Riggs integrates eerie old photographs into this story seamlessly. You’ll be reading along about a character, and then turn the page, and there it is: a crying boy in a bunny costume, beautifully dressed twin girls who are ominously faced away from the camera, a young boy with a monocle. The best part is that they are absolutely real photos, which makes them even creepier. They contribute to the melancholy, supernatural tone of the story. After reading some reviews, I found that some people didn’t necessarily know how to respond to the between-genre feel of this book. Is it written for adults? Is it YA lit? Is it science fiction? Light horror? Personally, I think it is a little of all of the above, and I really like that. The genre-crossing gives it a very unique feeling. I loved the atmosphere of this book. It feels like part X-men, part science fiction, part ghost story, part graphic novel (because of the photographs), and part war story. It made me very happy for 24 hours! Riggs, Ransom. 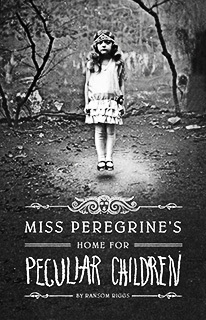 Miss Peregrine’s Home for Peculiar Children. Quirk Books: Philadelphia, 2011. 348 pp. Ages 14 and up. Posted on November 7, 2011 May 8, 2013 by ShannaPosted in Adventure, ALA/YALSA Best Fiction for Young Adults, Horror, Magical Realism, Mystery, Nontraditional FormatTagged horror, monsters, orphans, special powers, time travel, WWII. What a great idea.. making a story out of real photographs… I’m astonished every time I read your reviews, and wonder how you find these amazing books.